I am writing this at 2:37 pm, Monday, October 11, 2010, which is saying the same thing as 8:37, Monday, Tekemt 1, 2003. Here there are two types of time: Ethiopian and ferenji (foreign) time. Let’s start with the time of day. The new day comes as the sun rises, so our 6 am is 0:00. This is when the days and the hours begin. It is still Sunday at 5:45 am, but at 6 am it is monday. Language school starts at 2:30, two and one half hours after the sun has kissed the ground. You eat lunch around 6 and dinner is around 12. Taxis stop running anywhere from 2-4 in the evening. Some places set their clocks to ferenji time while others use Ethiopian time, but they always say Ethiopian time. On the day on school we learned how to say what time it is. I was so lost. I barely knew the numbers and our teacher had the clock at noon and kept saying 6. That is how I learned about the time difference. 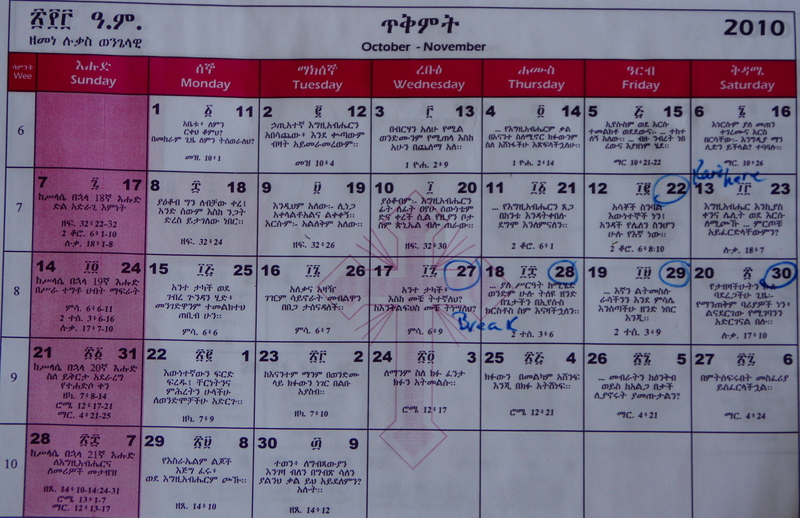 The Ethiopian Calendar is made up of 13 months, twelve with 30 days and one with five days (six in leap year). We use what is called the Gregorian calendar and Ethiopia uses the Ethiopian calendar. New Years is Celebrated September 11 and the last month of the year is only 5 days, so September could be neuhase, pagume or meuskeuruem (Ethiopian months). Christmas is celebrated January 5th. The Ethiopian Calendar is 7-8 years behind the Gregorian calendar, depending on if it is before or after September 11. There calendar is based on an old Coptic Calendar (13 months) and it follows the Julian system of adding a leap year every four years. How many of you think we add a day every four years? We do not. We do not add a day on leap years that are divisible by 400. There are also Ethiopic numbers, but thankfully they have been abandoned and arabic numerals are used because there is no zero. If you are confused, I am right with you! How interesting…and confusing! Praying for you as you learn the language and how to tell time. Good blog. Thanks for sharing. Well, it sounds like everything is as clear as mud. And to think there are those occasional times in the states when I wake up and ask myself, what day is it? I pray your days are full but also relaxing. oh my word. confusing! cultural differences amaze and baffle me at the same time. love you steph! I hope you are getting settled in and that you feel at home! I can’t wait to hear more about your new life and all the ways God is going to use you because you died to self and did hard things for Him!!!! The time thing is just too confusing. The 13 month thing is pretty cool. So much to learn. No wonder so many of my students from Ethiopia and Eritrea have a hard time with time and dates! I knew they had a different system but none of the students have ever been able to explain it to me… your explanation is actually really helpful to me! Thanks Steph. Love ya and praying for you!